Need a place to do artwork that isn’t on your kitchen table? Want to meet up with other artists in the community for a night of creative productivity? 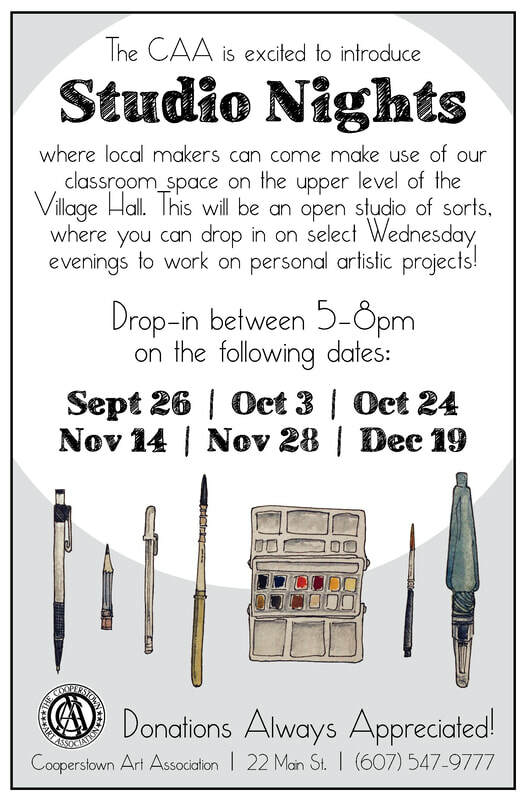 The CAA is excited to introduce STUDIO NIGHTS, where local artists can come make use of our classroom space on the upper level of the Village Hall. This will be an open studio of sorts, where you can drop in during the designated hours to work on personal artistic projects. There will be no formal instruction, but a monitor will be present to answer questions. STUDIO NIGHTS will be on select Wednesdays from 5-8pm. You can drop in at any time and donations are always appreciated! Chairs, tables and easels are provided. We will have various art supplies available for limited use, but please plan on bringing your own (non-toxic) materials! We hope that these STUDIO NIGHTS will be able to provide you with a place to go to finish that work-in-progress, start something new or refocus your creative energies! The Cooperstown Art Association is located at 22 Main Street in Cooperstown, NY, in the Village Hall on the corner of Main and Fair Streets. Please contact the Cooperstown Art Association at 607-547-9777 with any questions! Gallery Hours: Daily 11-4. Sunday 1-4. Closed Tuesdays Labor Day through Memorial Day.